After three years of destruction and bombardment, the war in Yemen has reached what many believe will be an even more deadly stage. Despite the efforts of the United Nations and other international organisations to avert it, this week saw the start of the Saudi-led coalition’s assault on the port town of Hodeida. Aid agencies warn that the humanitarian toll could be truly horrendous, with Save the Children estimating that 300,000 children are at risk of injury or death as a result of the fighting. Hodeida has been a particular focus of the ongoing civil war, with over 70% of Yemen’s food and aid shipments passing through the town. The years of war, and the breakdown of vital infrastructure, have made it an even more critical lifeline for people across the country. Its importance was made clear last year when Saudi forces ignored pressure from the international community and imposed a strict blockade on the port. Lifesaving goods were stopped from entering, and, despite some easing over recent months, food and fuel deliveries are still far beneath the levels that Yemen needs. Even prior to the bombing, the people of Yemen were enduring what the United Nations Secretary General has called the “world’s worst humanitarian crisis.” UN figures show that 22.2 million people are in need of assistance. Schools, hospitals and vital infrastructure have been destroyed across the country, leading to mass starvation and the spread of deadly diseases. Even this week, MSF reported that one of its cholera treatment centres being destroyed by the Saudi-led coalition. It is a man-made crisis, and one that has been exacerbated by the complicity and support of arms companies and politicians across the world. The UK government bears a particular responsibility, with UK fighter jets and bombs having played a central role in the bombardment. Since the conflict began the UK has licensed over £4.6 billion worth of arms to the Saudi regime. It is almost certain that these weapons are being used right now in Hodeida. The arms sales have been complemented by unbending and uncritical political support. The depravity of the relationship was on full display in February, when the Crown Prince of Saudi Arabia, Mohammed Bin Salman (MBS) visited London. Over the course of three days he was given the full red carpet treatment with fawning appreciation and tributes of Downing Street and Buckingam Palace. He took part in photo opportunities and enjoyed the prestige and legitimacy that goes with a state visit. We were all told what a progressive force he supposedly is, with far less being said about the appalling human rights abuses that are carried out against Saudi people every day, or the war he has overseen. Unsurprisingly, his visit ended with celebrations and cheering for BAE Systems and the other arms companies that have profited from the humanitarian catastrophe in Yemen. As MBS flew out it was announced that the UK and the Saudi military were one step closer to a multi-billion pound arms deal. The rampant hypocrisy and callous doublespeak of the government’s appalling position was made even clearer this week, when the Middle East Minister, Alistair Burt, stressed that “only a political solution can bring long-term stability to Yemen – there is no military solution.” It sounds like a fine sentiment, but one that is totally at odds with a foreign policy that has only fuelled and prolonged the war. If Burt and his colleagues really believe that there is no military solution then why have they done so much to strengthen and support the Saudi military? Why have they continued to allow UK weapons to be exported and used in a military campaign which by their own admission cannot succeed? Every major humanitarian organisation with people in Yemen has warned that the humanitarian situation is one of the most desperate in the world, and that it could be about to get a lot worse. The history books will show that Ministers like Burt, and governments like the UK, have enabled the suffering. Now they must do everything they can to stop it. Message to UN envoy to Yemen ,Mr Grits, an international community ,and US to stop war crimes on Al – hodedah Port in Yemen . We feel so sorry for what Saudis , EUA and US have been conducting war crimes since 2015 , as well as they have lunched horrible operation on 13, June 2018 on al Hodeidah city which is the most important sea port on Yemen . Hodeidah city populated by 400, 000 person and it has sea port supported food , oil , goods and all things for around 25 million of people on Yemen . It is clear that US foreign policy that used anti Yemen and Arabian nation don’t care about human and civilians . It wanted to achieve strategic objects over civilian and using Saudis and EUA as a card and woods to achieve political goals . US solders raped many young girls at 15 age on Abu Gareeb in Iraq , also they killed thousands of kids . Women . As well as they send drones to kill innocents in Yemen . Beside that US forces send missiles to kill leybia and Syrian people . US used all kinds of banned weapons that killed women , kids and destroy all vital projects on Yemen . They have been bombing residents area ,homes , schools , bridges on Yemen for no reasons . Beside that US want fight Iran and Russia on Yemen to protect own strategy . Shame on you US and don’t talk about human right laws , justice , democracy anymore . US forces must leave Yemen, Arabian lands and sea soon . We will feel happy and secure on Yemen and Arabian nation if US military forces , fleets , warships withdrew from Yemen and Arabian lands . 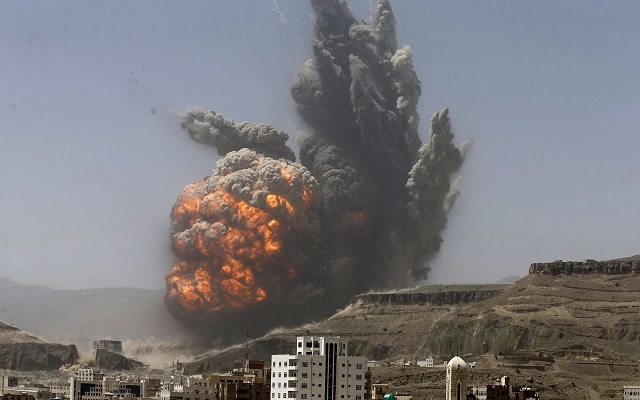 Military operations in Yemen never solve issues . Because US and Sauds lead coalition is a major issue . The last illegal process only drive Yemeni population to more war crimes , famine , and instability on Yemen and Arabian nation. The Union of Arabian Academics ask US to stop involving on Yemen and Arabian issues . We call on all parties on Yemen and Arabian leaders , kings , rulers to stop war and come to table to solve all problems . Statement by executive office on TUOAA . President The Union of Arabian academics .